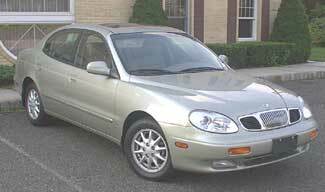 The Daewoo Leganza is surprisingly good for a Korean sedan. It is nimble, with a firm but cushioned ride – not luxurious, but not too harsh, either. The steering wheel moves too easily, though, and does not recenter quickly enough. The Leganza engine is noisy and buzzy when pushed. The engine also tends to bog when first starting out. Gas mileage is about right for a V-6, which it is not. Power is better than one would expect on the freeway, and passing is very easy, even up hills or with the air conditioner on. The transmission is prone to lurching. The interior is well styled, with polished faux wood at strategic points.